Morning everyone! I hope you had a lovely weekend and did something that you enjoyed!! We spent quite a lot of Sunday afternoon lost in a Maize Maze! In fact, we managed to find our way through three different Maize Mazes!! Sprout also enjoyed her first proper ride on a traditional carousel with her Aunty and Granny. Today, it’s time for another recipe. This month we have used one from the BBC Good Food website. If this site is new to you, have a look when you get a chance as it's great for mid-week inspiration! It allows you to easily search through 1000s of recipes according to different criteria e.g. calories, cuisine type, highest rated, course etc. You can also login and save your favourite recipes as well as add you own successful recipes. 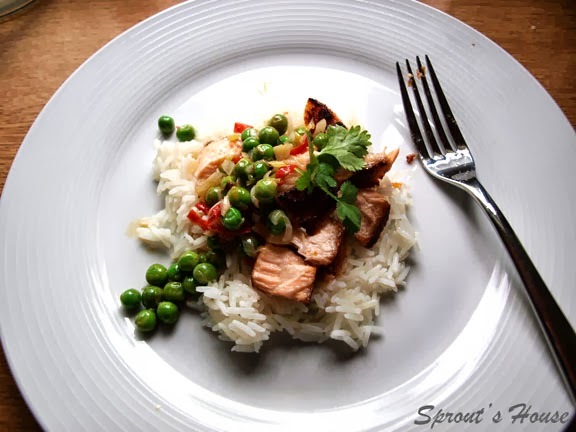 This is about the easiest recipe I have ever come across – grill the salmon, then chop up the chilli, lime zest and spring onions, and stir fry in a knob of butter or dairy free alternative. Add lime juice and pour over salmon. Scatter with coriander and serve with boiled rice…. and you’re done. (I also added in some peas - got to eat your 5-a-day! It passed the Sprout test – she ate it!....But not the peas! Oh well - you can't win them all! 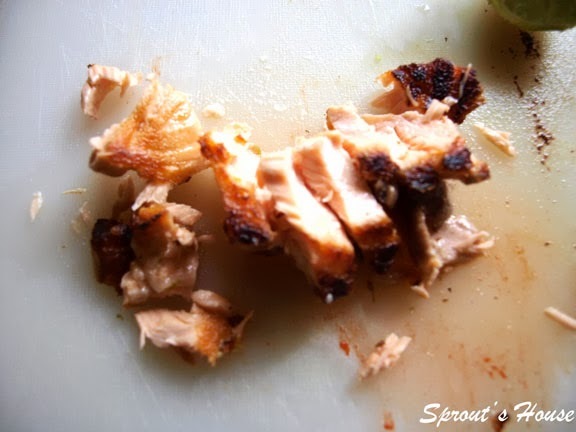 Sprout’s salmon did get a little cold whilst I cooked the chilli and lime butter, but this could easily be remedied by cooking them both at the same time. Nada – just delicious salmon in a fresh and zesty dressing. Next time, you fancy some salmon try out this recipe.